강칠용 박사는 약 50여년전인 1966년부터 바이러스학(virology) 연구를 시작하였고 HIV 가 알려진 이후 1987년부터 에이즈바이러스에 대해 본격적으로 연구를 시작했습니다. 강칠용 박사는 AIDS 백신외에 난치병으로 알려진 'C형 간염 백신' 등도 연구 중에 있고, 더 나아가서 한 해 1,300만명의 목숨을 앗아가는 바이러스로부터 인류를 지킬 세계적인 바이러스 연구소를 한국에 설립하는 꿈을 가지고 있습니다. 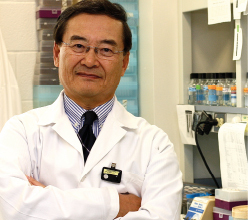 Dr. Kang, Chil-Yong is a founder of Sumagen and a virology professor at Microbiology and Immunology at the University of Western Ontario Canada. His pursuit of virology started over 50 years ago, and he has continued his life-long research of HIV/AIDS vaccine since 1987. Not only HIV research, he has his dream and goal to establish the viral research institute in Korea to stop transmitting viral diseases. 1974 - 1982Professor, Department of Microbiology South Western Medical School, University of Texas, U.S.A. Copyright(c) 2017 www.sumagen.com All rights reserved.